The present Dalarossie Church was built in 1790, with repairs and alterations by George Rhind in 1856, also W L Carruthers, 1904. A simple rectangular building orientated E-W, it occupies the site of the earliest church, dedicated to St Fergus, which is first mentioned 1224 x 42, when it was given to Elgin Cathedral. Dalarossie was joined to part of Moy parish in 1618. OSA 1793; NSA (Inverness); A Jervise 1875-9; ISSFC 1895; R Macdougall 1895; J Mackinlay 1914; G Hay 1957; I B Cowan 1967. The Priest's Stone was formerly situated on the N. side of Dalarossie churchyard (Jolly 1882) but was moved into the church by 1889 (ISSFC 1898). It is basin-shaped and said to have been used for baptismal purposes (Jolly 1882). It is included in a list of cup-marked stones by Romilly Allen (1882). The hole was drilled through the bottom in recent times (Jolly 1882). W Jolly 1882; J R Allen 1882; ISSFC 1898. Clach an t-Sagairt, a baptismal font as described and planned; not a cup-marked stone; still in Dalarossie Church. Visited by OS (N K B) 8 November 1966. See assoc. docs. 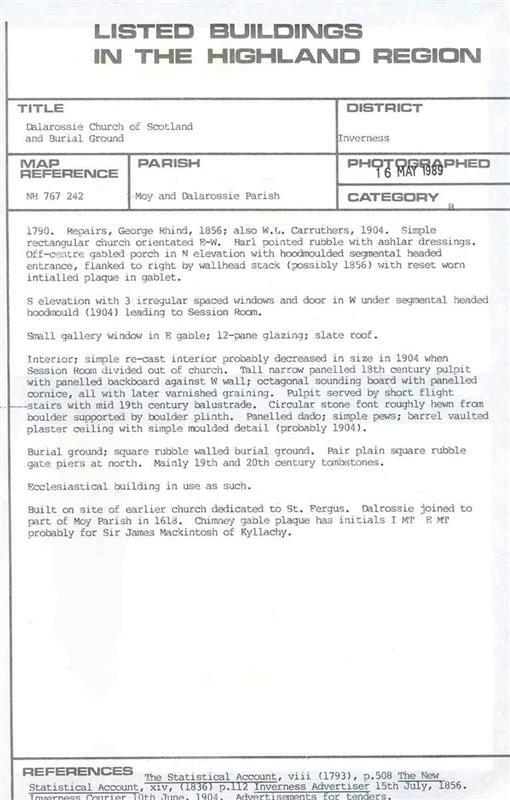 File (gravestone photos). According to local tradition the bowl-shaped stone was supposedly found in the ground when the glebe land was being ploughed. It was then placed within the kirkyard, leaning against the gate, and was there within living memory. It was taken into the church during the incumbency of Mr Cameron (1932-40). It was created into a font in the 1940s on the recommendation of Miss Kathleen Mackenzie of Glenkyllachy and Ann Glynne-Percy's mother, Mrs Douglas Bulloch. The problem was supporting the bowl, since no support was found in the field. Ann Glynn-Percy and her mother searched the ruins of Harriet's Croft, near Old Dalarossie Schoolhouse, and found a suitable stone. Murdo MacAskill then crafted the font as it is today. Sir John Sinclair (ed. ), 1791-9, The statistical account of Scotland, drawn up from the communications of the ministers of the different parishes, vol. 8, p. 508 (Text/Publication/Volume). SHG2606. NSA, 1845, The new statistical account of Scotland by the ministers of the respective parishes under the superintendence of a committee of the society for the benefit of the sons and daughters of the clergy, vol. 14, p. 112 (Text/Publication/Volume). SHG2597. Jervise, A, 1875-9, Epitaphs and inscriptions from burial grounds and old buildings in the north-east of Scotland with historical, biographical, genealogical and antiquarian notes, vol. 2, p. 54 (Text/Publication/Volume). SHG2365. Allen, J R, 1882, 'Notes on some undescribed stones with cup markings in Scotland', Proc Soc Antiq Scot Vol. 16 1881-2, p.79-143, 122 (Text/Publication/Article). SHG1208. Jolly, W, 1882, On cup-marked stones in the neighbourhood of Inverness; with an appendix on cup-marked stones in the Western Islands, 380-1 (Text/Publication/Article). SHG1317. Macdougall, R, 1894, 'Strathdearn - some church notes', Trans Gaelic Soc Inverness Vol. 19 1893-4, p.49-50, 49-50 (Text/Publication/Article). SHG1554. Macdougall, R, 1895, 'Notes on the ecclesiastical history of Strathdearn', Trans Gaelic Soc Inverness Vol. 19 1893-4, p.49-62, 49-50 (Text/Publication/Article). SHG1219. ISSFC, 1898, 'Excursion to Kyllachy, 24th August 1889', Trans Inverness Sci Soc Fld Club Vol. 4 1888-95, p.56-66, 64 (Text/Publication/Article). SHG770. MacKinlay, J M, 1914, Ancient church dedications in Scotland: non-scriptural dedications, 211 (Text/Publication/Volume). SHG2475. Hay, G, 1957, The architecture of Scottish post-Reformation churches, 1560-1843, 259 (Text/Publication/Volume). SHG2307. Cowan, I B, 1967, The parishes of medieval Scotland, 43 (Text/Publication/Volume). SHG367. Leonella Longmore, 2000, Land of Churches (Text/Publication/Volume). SHG2414. <1> Archaeology for Communities in the Highlands (ARCH), 2011, Digital site gazetteer and archive for ARCH Community Timeline Project: Strathdearn, Site 8 (Collection/Project Archive). SHG25599. --- Text/Publication/Article: Allen, J R. 1882. 'Notes on some undescribed stones with cup markings in Scotland', Proc Soc Antiq Scot Vol. 16 1881-2, p.79-143. Proc Soc Antiq Scot. 79-143. 122. --- Text/Publication/Article: Macdougall, R. 1895. 'Notes on the ecclesiastical history of Strathdearn', Trans Gaelic Soc Inverness Vol. 19 1893-4, p.49-62. Trans Gaelic Soc Inverness. 49-62. 49-50. --- Text/Publication/Article: Jolly, W. 1882. On cup-marked stones in the neighbourhood of Inverness; with an appendix on cup-marked stones in the Western Islands. Proc Soc Antiq Scot Volume 16. 300-401. 380-1. --- Text/Publication/Article: Macdougall, R. 1894. 'Strathdearn - some church notes', Trans Gaelic Soc Inverness Vol. 19 1893-4, p.49-50. Trans Gaelic Soc Inverness. 49-50. 49-50. --- Text/Publication/Volume: Hay, G. 1957. The architecture of Scottish post-Reformation churches, 1560-1843. 259. --- Text/Publication/Volume: Jervise, A. 1875-9. 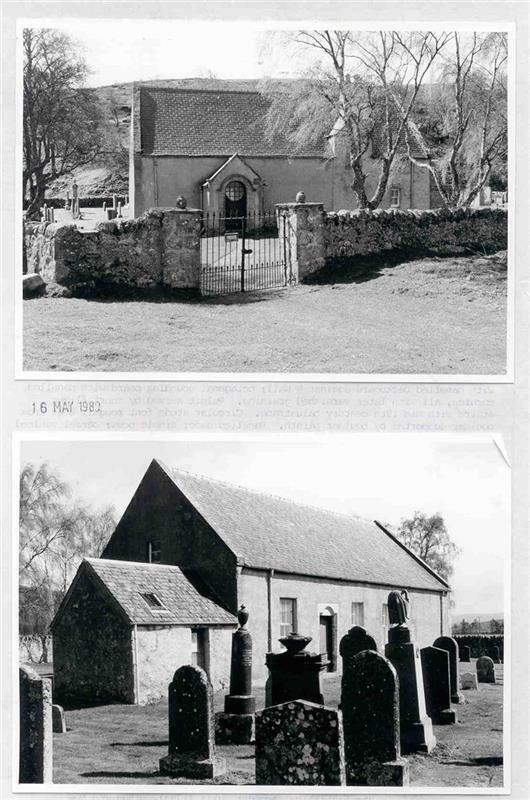 Epitaphs and inscriptions from burial grounds and old buildings in the north-east of Scotland with historical, biographical, genealogical and antiquarian notes. vol. 2, p. 54. --- Text/Publication/Volume: Leonella Longmore. 2000. Land of Churches. --- Text/Publication/Volume: MacKinlay, J M. 1914. Ancient church dedications in Scotland: non-scriptural dedications. 211. --- Text/Publication/Volume: NSA. 1845. The new statistical account of Scotland by the ministers of the respective parishes under the superintendence of a committee of the society for the benefit of the sons and daughters of the clergy. vol. 14, p. 112. --- Text/Publication/Volume: Sir John Sinclair (ed.). 1791-9. The statistical account of Scotland, drawn up from the communications of the ministers of the different parishes. vol. 8, p. 508. --- Text/Publication/Volume: Cowan, I B. 1967. The parishes of medieval Scotland. 43. --- Text/Publication/Article: ISSFC. 1898. 'Excursion to Kyllachy, 24th August 1889', Trans Inverness Sci Soc Fld Club Vol. 4 1888-95, p.56-66. Trans Inverness Sci Soc Fld Club. 56-66. 64. <1> Collection/Project Archive: Archaeology for Communities in the Highlands (ARCH). 2011. Digital site gazetteer and archive for ARCH Community Timeline Project: Strathdearn. Yes. Digital. Site 8.